With the huge rise in deer tick populations and the spread of Lyme disease, many friends of wildlife are welcoming opossums into their yards. Why? Scientists have learned that opossums act like little vacuum cleaners when it comes to ticks – with a single opossum hoovering up and killing an estimated 5,000 ticks in a season. Opossums, sometimes referred to just as possums, are a benefit to ecosystems and a healthy environment beyond eradicating ticks. They will catch and eat cockroaches, rats and mice – in addition to consuming dead animals of all types (also known as carrion). Gardeners appreciate opossums’ appetite for snails, slugs and for cleaning up over-ripe fruit and berries. Opossums are also resistant to snake venom and actually prey on snakes, including venomous species such as copperheads and rattlesnakes. Having opossums around can minimize chances of encountering venomous species close to your home. 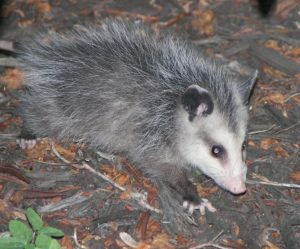 Adult opossums are solitary and nocturnal—active at night—and generally live in burrows and cavities that they find ready-made rather than create themselves. They seek shelter underground, in trees or anywhere in between. When frightened or harmed, opossums suddenly freeze and lie still as death. They have no control over this response, which could be said to paralyze them with fear or have evolved because almost any predator can outrun them. 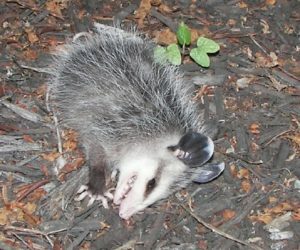 If left unharmed, a catatonic opossum will recover in roughly one to four hours. This amazing species is North America’s only marsupial (pouched mammal). When the so-called Great American Interchange occurred with the closing of Central America around 3 million years ago, the opossum was pretty much the only marsupial from South America that successfully moved to and survived in the north.